In the women’s event three Winnipeg teams have already won enough games to qualify for the playoffs. Jennifer Jones, Kerri Einarson, and Tracy Fleury will be moving on after winning at least three of their first four games. USA’s Nina Roth, and Ottawa’s Rachel Homan are also guaranteed spots on the weekend. Eight of the 15 teams will move on to the playoffs and play for the lion’s share of the $100,000 purse. In the men’s event, three Olympic gold medallists have already punched their tickets to the weekend. The 2006 Olympic champion, Brad Gushue (St. John’s), 2014 winner Brad Jacobs (Sault Ste. Marie, Ont. ), and 2018 winner John Shuster (USA) all have three wins out of the gate, and will move on. 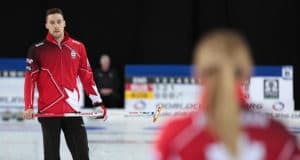 The surprise qualifier is USA’s Rich Ruohonen who is currently ranked 20th of the World Curling Tour Order of Merit. Usually, they’d have been invited to the Tier 2 event, but with many of the European and Asian teams at home playing in various championships, the invites went to teams further down the list than usual. Speaking of Tier 2, Saskatoon’s Kirk Muyres and Kingston, Ont.’s Scott McDonald have qualified, starting with three wins. Tanner Horgan (Sudbury Ont.) 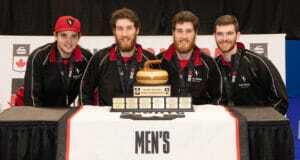 and Charley Thomas (Toronto) have finished their round robin with 3-1 records, and will move on. The Tier 2 winner will receive an entry to an upcoming Grand Slam event, and also the end of the year’s Champions Cup – along with cash and valuable Canadian Team Ranking System Points. The purse for the Tier 2 event is $50,000. So far in the women’s Tier 2, Toronto’s Hollie Duncan is the only Canadian team to punch her ticket to the weekend. The recent Ontario Scotties champion has finished her round robin with a 3-1 record and will move on along with Japan’s Sayaka Yoshimura, Switzerland’s Binia Feltscher, and South Korea’s Un-Chi Gim. In all events, a 2-2 record will likely lead to tiebreakers to see which of the fifteen teams will reach the playoffs. 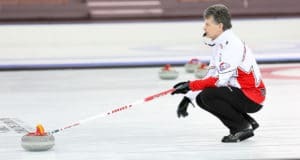 Games will appear on Rogers Sportsnet channels all weekend, while scores and results can be found on CurlingZone.com.